News & Articles Archives | Wedding Band | Corporate Function Band | Party Band | Berkshire | !daft! After a long year you can finally let your hair down and start looking forward to spending some time at home with your family. You also get to spend time with your work colleagues in a social setting at the office Christmas do. With all the food, drink and high spirits about the company Christmas event can be the talking topic of the office for weeks. We’ve all been there. Work Christmas do’s come in all shapes and sizes. They can be modest affairs for small numbers and held in the office, or much larger, corporate events. 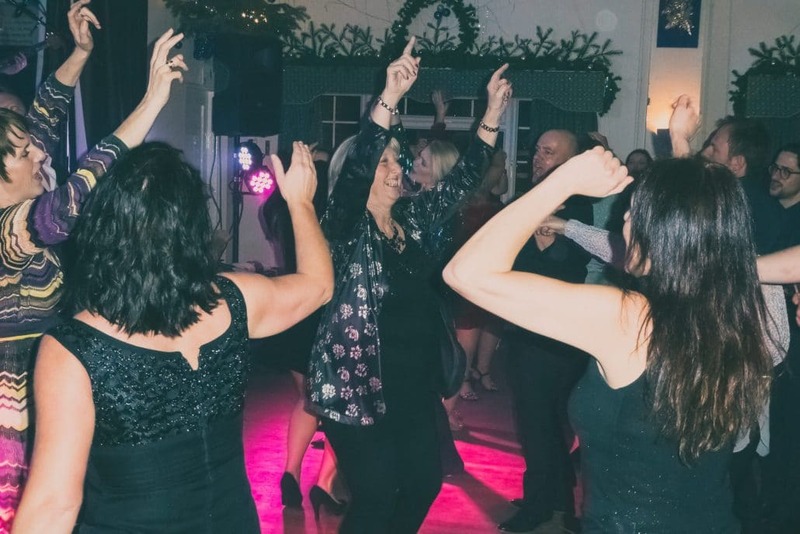 Whatever type of office Christmas party you’re planning one sure fire way to make your Christmas party amazing is to book a live Christmas party band. !daft! guitarist Adam getting ready to rock a Christmas party crowd. 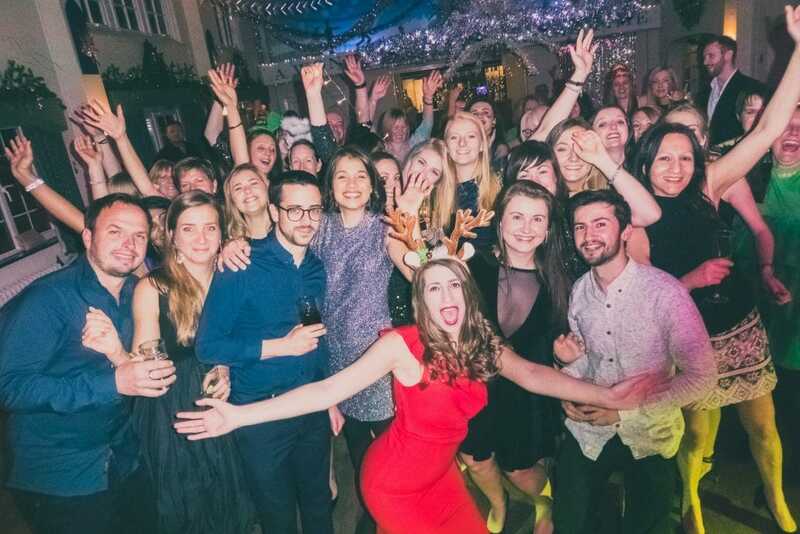 Why book a Christmas Party band? DJs are often the “go to” entertainment for parties and we all know they do a phenomenal job. But is there a way to really push the boundaries, break tradition and do something new and different? 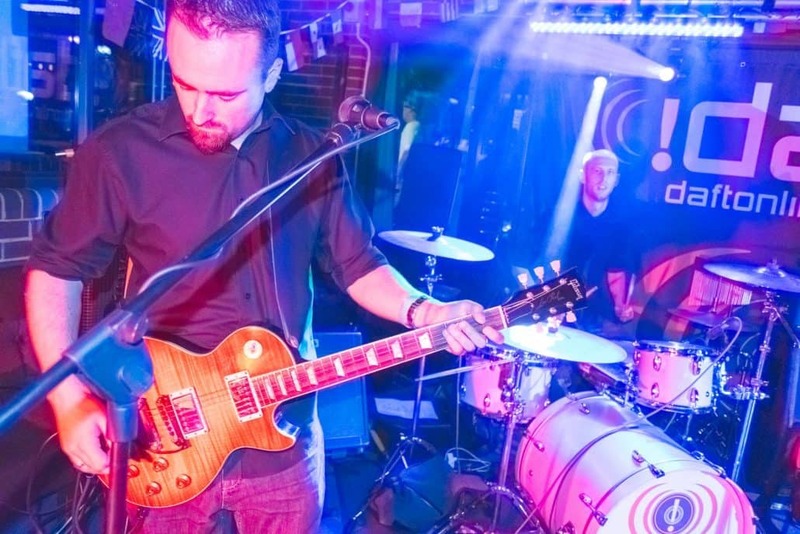 Booking a live band is one way to create a wow factor and a guaranteed way to fill the dance floor all night. Offering a convenient combined live band and DJ service for non-stop entertainment. Bringing energy, excitement and engagement to your event. Providing a smooth and efficient booking process with regular communication. Further enhancing your party with impressive sound and lighting, sound & lighting engineers, photographers and videographers. Offering expert advice based on years of experience performing and planning private, public and corporate events. But don’t just take our word for it. Hear directly what previous clients have to say about !daft!. Click here to enquire now or call us on 0333 456 4556 and let’s get planning! A beautiful winter wonderland theme. Something that ensures a Christmas Party stands out, is a theme. There are so many to choose from that will add that extra special element and fun to the night. From Santa’s grotto to Winter Wonderland to Christmas Movies! If you’re in the mood for dressing up why not ask !daft! to dress as part of your theme? 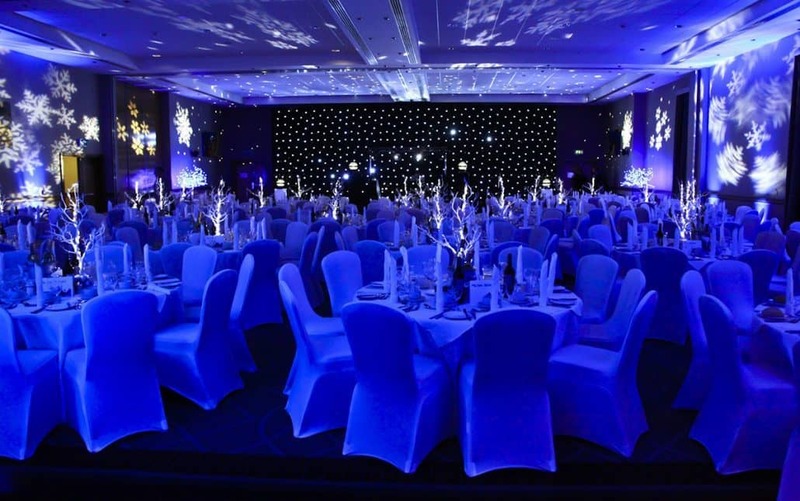 If you need some help you should take a look at Eventa’s awesome Christmas party theming ideas here to really get the creative juices flowing! Or contact us. !daft! have performed for various companies over the years including Deloitte, The New Victoria Hospital, Dell, Royal Air Force, BBC, Allianz, Fujitsu and many more and we have some fabulous ideas and contacts that will help you. Start now by calling us on 0333 456 4556 or visiting our dedicated Christmas Events page to discover how !daft! can get you all rockin’ around the Christmas tree this year. Ever heard of projection mapping wedding cakes? This impressive lighting and projection technique turns your wedding cake into a colourful, moving and modern age work of art. They are great fun and look fantastic. As the technology is relatively new it is still uncommon to see them about making them very appealing to those who like to do things differently. Since we published this blog piece we have received a number of enquiries for projection mapping wedding cakes, however we would like to remind you that we are a wedding band, not a cake or projection company. Therefore, could we please ask you not to enquire to us about these wonderful pieces of wedding brilliance. 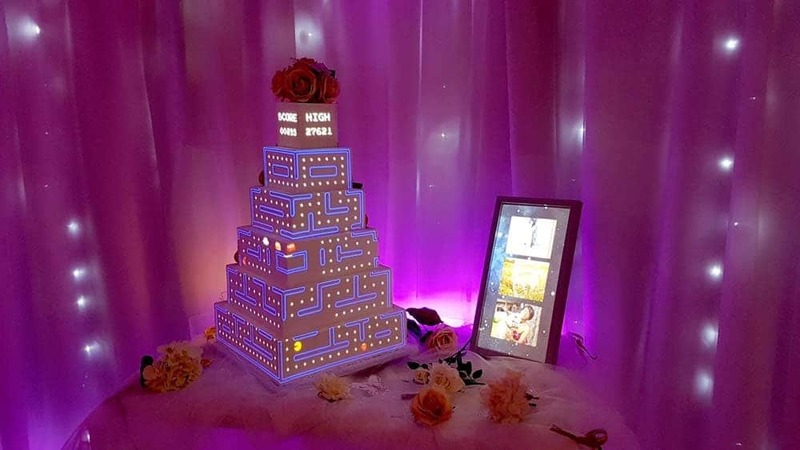 If you would like to talk to someone about booking or hiring a projection mapping wedding cake, then please see our friends over at Angie Scott Cakes. You can contact Angie and her team on 07854 208 288. The great things about projection mapping cakes is that you can personalise them. Angie Scott and her team are able to create specific projections unique to you. Do you and your partner share a hobby? Or love a particular place? Angie Scott can create a beautiful projection mapping cake that reflects both you and your partner down to the finest detail. Here is a STUNNING Disney inspired projection mapping wedding cake. Contrary to what you may have been told, the projection mapping cake you get from Angie Scott will be real. You can actually cut it and eat it. And they taste sublime! In addition to that, the cake will be made specifically for projection mapping and will use ingredients best suited to showing off your projection. In conclusion, we LOVE Angie’s cakes. Not only are they fun and interesting but they bring a touch of magic to your wedding. Give Angie a call today on 07854 208 288! Sound limiters are electrical devices that measure the amount of volume, or noise, in a room. If that volume reaches a certain level the sound limiter is designed to cut the electric supply to the stage. The visual indicator on the limiter works most commonly on a “traffic light” system, green = no problem, amber = sound levels approaching the threshold, red= threshold breached. If the light stays red for more than a few seconds, the limiter will then cut the power to the stage. This will leave you with no lights, action or music. To safeguard both of us we will contact your venue as soon as you book us to enquire to whether one is in use. Whilst there take a look in the corner of the function room. If you see a small box or unit with obvious red/amber/green lights on the front, the chances are it’s a sound limiter. THAT YOU REQUEST TO TURN OFF THE SOUND LIMITER FOR YOUR EVENT. If you have exclusive use of the venue this is usually more than acceptable. Once granted please get this confirmation in writing. We wouldn’t want to end up in a discussion on the night with someone who denies all knowledge of the agreement. WHY DO VENUES HAVE SOUND LIMITERS? Where venues are near residential properties they have a duty to keep any noise to a reasonable level. In rare cases your venue may also have been instructed by the local authority to have one installed. There isn’t yet any legal requirement to protect customers or party guests, who are there voluntarily, from loud noises. But there is a requirement for employers to protect employees and contractors. The venue may want to keep noise down for other resident guests or simply just have greater control over the band’s volume. WHAT LEVEL SOUND LIMITERS USUALLY SET TO? You will find in most cases that sound limiters are set to between 80-90 decibels (db). This is an average based purely on our experience and you may find yours is set to a different level. Most live amplified rock & pop gigs register at between 100 and 115db. Acoustic drums kits alone can easily register 105 – 110db. 80-90db might not sound like much less than 100dB, but in fact the decibel scale isn’t a straight line. For example 110db actually sounds almost twice as loud as 100db, NOT a “tenth” louder. It’s really not very loud at all. In our opinion this is too quiet an environment to host a live rock band. Check out the detailed infographic showing you what kind of decibel levels are produced in everyday, typical situations. We held a professional sound measurement device next to a tap of running water. The tap was fully open and was falling into a stainless steel sink. We held the measurement device around 6 inches from the sink and it registered at around 76db. SO WHAT’S THE PROBLEM WITH SOUND LIMITERS AND LIVE BANDS? Sound limiters are frequently set lower than what is reasonable for a live band to work with. The reality is anything below 95db is too low for any party band to perform properly. There is never a guarantee that the limiter at your venue has been correctly installed, or that it is being operated by someone qualified in sound engineering. The system must be correctly installed, calibrated, maintained and operated for anyone to have total confidence that everything is being measured accurately. Not only are sound limiters inconveniencing but you also have to wait for them to be reset by a venue representative. If said person is not in the immediate vicinity then this can mean the power is off for an indeterminate amount of time. If the limiter keeps tripping then you can see how this can begin to turn into quite a ridiculous exercise. The audience will always assume the band have messed up! To go from a live band playing a party track to total silence in a fraction of a second often in results in 150 confused faces staring at us in the assumption that our equipment has failed or we’ve done something wrong. In our opinion sound limiters tend to adversely affect the mood that you and we will be trying to create at your wedding by essentially “dulling” the atmosphere. Sound limiters can, and do, damage the band’s equipment. PA’s, amplifiers and mixing desks require an uninterrupted supply of power and to be switched on and off in the correct manner. The fuses and valves in our equipment can be damaged when suddenly powered off and on again, speakers can pop and blow too as a result of signal spikes when the limiter kicks in. This is something we hear venues say all the time but we urge you to take this statement with a pinch of salt. We would not suggest for one second that venues would state a deliberate untruth. But you have to bear in mind that no venue is going to want to willingly deter you from booking their building and services by revealing that their noise policy doesn’t allow anything louder than a dishwasher at your wedding party. No sound limiter sits there doing nothing and if there is never a problem, then why have one? They have to, at some point, come into effect during live performances. Saying “there’s never a problem” isn’t enough, in our view, to confirm that we won’t have a problem. We certainly find it very difficult performing the same volume as let’s say, a hair dryer (80db). We are a rock & pop party band and you may well have booked us because you saw us performing in a way that you wanted to have at your wedding. You don’t want the band to be watching the traffic lights and trying to stop the red light coming on. Instead they should be focusing on giving their performance and keeping your dance floor full. THEY CAN AFFECT YOUR ABILITY TO ENJOY YOUR OWN WEDDING PARTY, AND WE’RE NOT COOL WITH THAT! We have heard many horror stories of sound limiters affecting the band’s ability to perform resulting in the constant stop-starting of music, circuit resets, audience confusion etc. We know of one wedding where the band tripped the system during the bride and groom’s first dance just 25 seconds into the performance. The first dance track was the beautiful Chasing Cars which as you may know is hardly a loud or powerful song, certainly in the first few minutes. This, for us, is just crazy. We are not divas and we do not care to be selfish or play at ridiculous volumes, but we do expect to be able to deliver what you have paid for and asked us to do. Sound limiters can, in some cases, make this virtually impossible. HOW WE CAN HELP IF YOUR VENUE HAS A SOUND LIMITER? Prior to booking we are happy to talk to your venue about their sound limitation policies. We’ll seek to ensure our mutual compatibility and we have done so many times before. We have also been successful in finding a compromise where required. 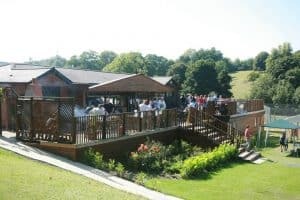 For example at some weddings it may be the case that the wedding party have booked out the vast majority (if not all) of the venue’s accommodation. This means that there are no other non-wedding guests to disturb. Therefore a sound limiter would seem unnecessary. We will also employ various tactics to minimise our peak volume impact where limiters are in operation. We have many ways of reducing sound impact without having to drastically affect the overall quality of sound. USE OUR EXPERIENCE AND COMMON SENSE! !daft!, and practically every other band out there, do not have any desire to play at uncomfortably high volumes. We want our clients and audiences to enjoy every aspect of our performance. Therefore it is in our interest to play at an acceptable volume level for the room and the event overall. You will find us to be experienced performers with the ability to set acceptable sound levels. This will create the right atmosphere without shattering the ears of others. In our experience, band members can dictate sensible sound levels simply by using their common sense, an ability which does not, unfortunately, always apply to sound limiters. If you have any questions about sound limiters, or if we can help in any other way, please feel free to contact us.